There’s a new tribe marching down Broadway in the Fashion District, and no, it’s not Lady Gaga and her dance troupe. 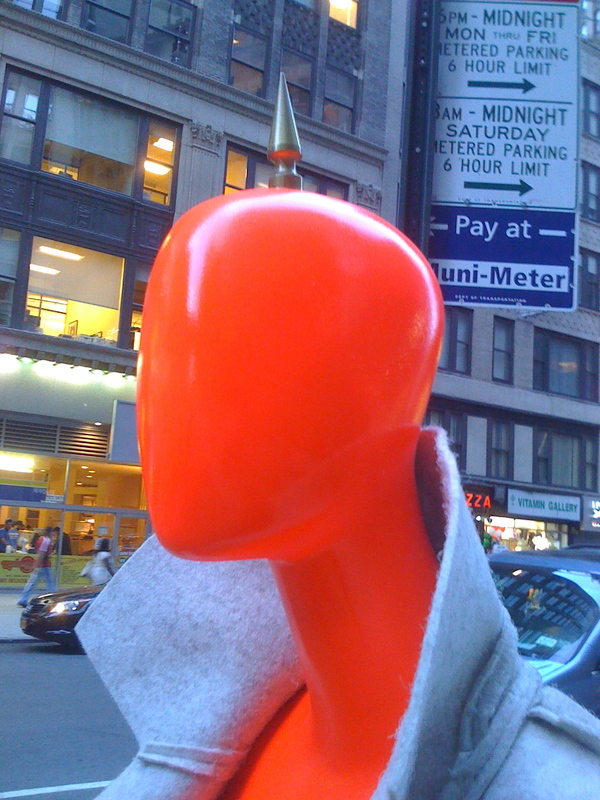 It’s a line of Ralph Pucci-designed mannequins strutting their weatherproof wares (wears) between Times and Herald Squares. What is the reason for this stoic entourage? 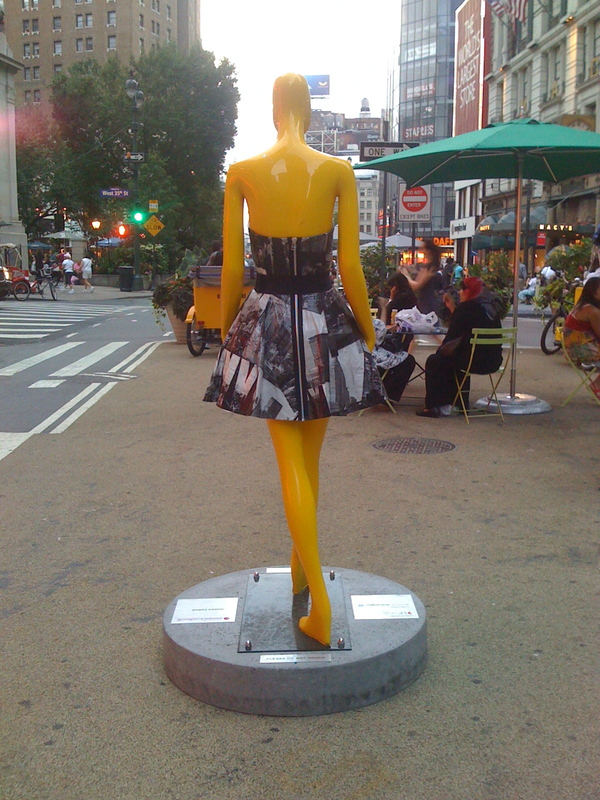 Well, like the fiberglass pigs, horses, and cows that cropped up around the US in previous decades, these hard-bodied silhouettes have been installed to build awareness and support for the fashion industry in New York City. So, are they doing this job well? As for the project itself, my initial reaction is that these mannequins get lost in the crowd. Some of the designs helped me focus on the successes of the fashion industry, whereas others really made me scratch my head and wonder about the level of innovation behind this project. And by that, I am not talking about the fashion designers’ work, but rather the people who decided this was the right kind of public art and the right kind of message to be promoting. For example, I love Yeohlee Teng‘s garments, which are made in New York, but the brick “skirt” begs for a different kind of display. I believe the Fashion District would be better served by something less literal, something more cohesive, rather than this rehashing of projects of yore. Yes, the pigs and the cows and the horses were successful, but that was at least 10 years ago. And fashion should be all about what is happening now or even next. And I hope what is next is not something from the early aughts, as design digression should not be the goal here. Although the Sidewalk-Catwalk may be drawing attention to some great fashion designers and these designers may very well be happy with the response, is this the aspect a public art project should be drawing attention to now? Isn’t the loss of manufacturing one of the biggest problems facing the garment district today? The Public Trust gets this and has been assembling their own project since 2009. I do hope that the public art that springs from their project proves to be more thoughtful and thought-provoking than this one. That said, it has come to my attention that there are many public artists in this city of 8 million people that have better ideas for drawing attention to the Fashion District and I’m wondering how many artists were considered in the bid for this display. 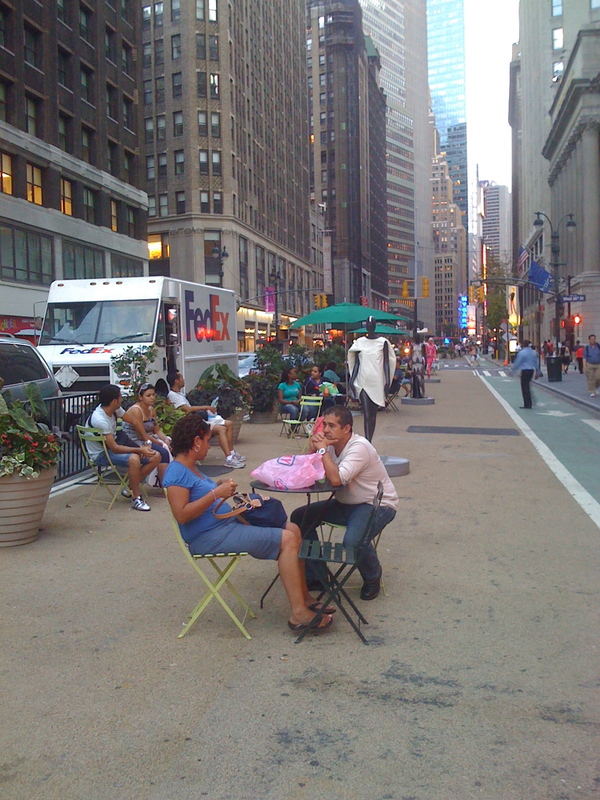 At a time when NYC is rethinking traffic patterns and bucking old systems, isn’t it time for the same kind of forward thinking to be applied to public art? 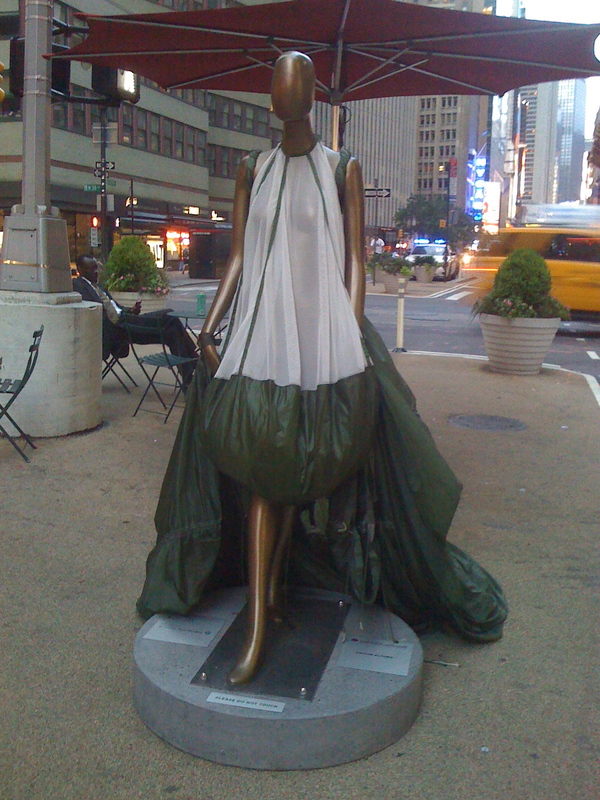 This entry was posted on July 16, 2010 at 4:07 pm and is filed under Fashion, New York City, Public Art, Public Space. You can follow any responses to this entry through the RSS 2.0 feed. You can leave a response, or trackback from your own site.